Are you interested in travelling to Palestine in September 2018? 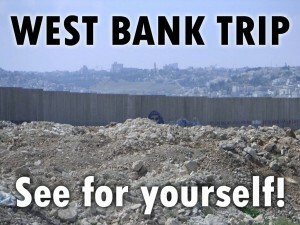 Would you like to see for yourself the situation in the West Bank? Would you like to stay in Bethlehem city and visit Jerusalem, Hebron and Ramallah? Would you like to meet with Palestinian and Israeli groups and individuals working for peace and justice in the region and hear what they’ve got to say? An 8 day trip to the West Bank will take place in from 15th – 22nd September 2018 and you are more than welcome to come along. For further details please contact Elaine on westbanktrip@eircom.net or 045 449 675 (after 7pm). Places are limited to 28 people so early booking is recommended. Note: This trip is not organised by the Ireland-Palestine Solidarity Campaign and we cannot answer your questions about them. However, we highly recommend these trips to our supporters – there is nothing like seeing for yourself the reality of Israel’s military occupation.